Festivals of flowers are very popular among the people of India. There are a number of festivals held in various parts of the country. Tulip festival is one of the most popular flower festivals in India. The festival is a great way to capture the flowering tulips of Kashmir as Srinagar has Asia’s largest tulip garden. The Tulip Festival displays a large variety of tulips. Large number of tourists comes to the venue to catch the sight of these beautiful tulips. The festivals also feature a number of cultural programs, sale of local handicrafts, Kashmiri folk songs and other forms of arts. On visiting this festival, you will also be able to taste traditional cultural Kashmiri cuisine. Tulip Garden of Kashmir is Asia`s biggest Tulip garden, on the shores of the famous Dal lake. Tulip festival is held annually in the month of April when tulips are in full bloom. The garden looks like a silken carpet of bright coloured sprawling tulips. Best time to visit is April-May. Nearly 60 varieties of beautiful and vibrant tulips grow in this garden, spread over 5 hectors of land. Tulips remain in bloom just for 15-20 days depending upon the temperature. 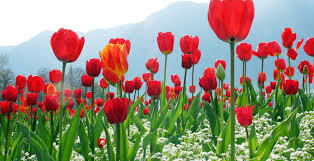 “Red, yellow, variegated, pink, white, orange, light blue, and magenta are the main colors of tulips. The scene is simply charismatic with floral charm. The view remains in the memory of a visitor forever. Cultural programs, Kashmiri folk songs, sale of local handicrafts, and preparation of traditional Kashmiri cuisine forms an eminent part of the entertainment of visitors during the festival. It’s easy to imagine why Yash Chopra chose kashmir as the muse for one of his eternal and most lyrical romances, Silsila. Amitabh Bachchan and Rekha’s tender medley (remember dekha ek khwab to yeh silsile hue?) amidst blushing tulip fields was not just the figment of an art director’s imagination come to life, but the beauty of Asia’s largest tulip garden – Siraj Bagh. Tour Route: – Srinagar, Mughal Garden Nishat, Mughal Garden Shalimar, Hazratbal Shrine, Shikara Ride, Gulmarg, Tulip Garden & Shankaracharya Temple are the highlights of this package. After refreshment at hotel continue your tour to famous Nishat Garden known as ‘Garden of pleasure’ built in 16th century (1633) by Mughal King Asif Khan. Then visiting Shalimar Garden known as ‘Garden of love’ built in 16th century (1619) by Mughal King Jehangir for his beloved wife Noor Jehan or (Mehr-un-Nissa) and later on pay a visit the famous White mosque of Srinagar city (Hazratbal shrine). Overnight in hotel in Srinagar.